I read this and thought it would be fun to do, and then I saw this event few minutes later. I also played a bunch of cool twine games right beforehand. So I made this. 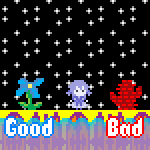 I also made it fit the ludum dare theme but I probably won't submit it to that. I liked the plot twists.. The break down and descriptions were what made it worth playing this one. I wouldn't have minded more content, but what was provided brought enough to make it happen. maybe a misleading thumbnail to boot.